Get out your diaries and keep November 9th free as that’s the day you’ll be able to buy Google Sightseeing – the book! We’ve got almost 100 of our favourite sights from the last year, licensed high-quality satellite photographs and fully re-researched each one. For our most dedicated fans there’s even a few sights that aren’t even viewable on Google Earth (including the spectacular world’s largest diamond mine). We’re very proud of what we’ve produced and we hope you’ll enjoy it as much as we do. 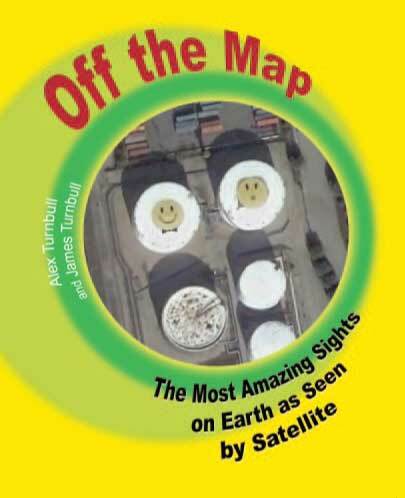 US Readers can pre-order Off the Map – The Most Amazing Sights on Earth as Seen by Satellite* on Amazon.com and our UK readers can order Not in the Guide Book – The wackiest sights in Google Earth, as seen by googlesightseeing.com* from Amazon.co.uk. * These are affiliate links, which make us a tiny extra percentage on each sale. Thanks! Oh wow. Congratulations. You’re published authors! So people write in their sights and you make a book from their hard work. Nice way to work it. Do we get any of your profit? I partially agree with Joe, I understand that profit as such is nearly impossible to dole out to hundreds of people across the world. What I would like to know is do the people at least get mention in the book? Yes people have suggested most of these locations, but that’s just a lat/long – we research and write all the site posts and have re-researched and written the entire book – so the hard work is definitely ours! Good luck with the book, guys, and thanks for continuing to provide this entertaining site. I don’t agree with the critical remarks made by other here. When contributing to any site on the web, you are making your work available for others to use. If people aren’t happy with that, they should just keep their sights to themselves! I’m sure it has take a huge amont of effort to license the images. If the critics think it’s easy, why don’t they take their own selection of suggestions from here, research the locations, and write their own book? By the way, I’d love to know why the title has to be different in different countries. Is it for legal or marketing reasons? Buy the book or look at em for free on here – not bloomin likely! Good work fellas! Keep livin the dream! and if that is the case, will certain ones that are relevant to the date they were taken not get seen (aircraft in flight, the volcanoes, the car crash ones) ? 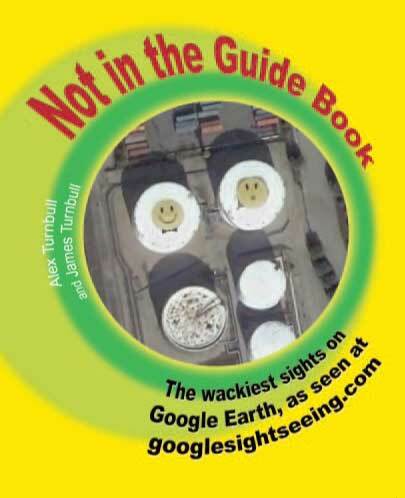 Great idea lads to have a book to work alongside the site, it should work both ways getting people from the web-site to buy the book and getting people who buy the book onto the site. Tell all the people who ask for some cash to sling their hooks, this is your site, your work, your baby. Just one more thing to say, is this the final cover design? if so, are you sure? The titles were chosen by the two publishers primarily for marketing reasons. They also designed the cover, which are the final versions. Ok fine with me, I just thought they could have made a little more of it. I bet you or Alex could have done a better job yourselves but hey your getting published so who is going to argue. Is it possible for you guys to post a few pages. I would really like to have a look inside before I purchase it. I think top contributors should receive one for free. Every time when you publish a new book. I’m not a contributor just an idea to keep them motivated. Congrats!! Looking forward to seeing my name PROMINENTLY featured in the ” Hole in the Coast” section. If not, expect to hear from my attorneys!! Luke, I’ve spoken to the publisher about a getting a sample couple of pages and they’re planning on sending me something to post up soon. Awesome! I guess the best way to do it would be to post the pages on Amazon as well as this site. Amazon has a feature where you can include sample pages. That way eveybody can see them. Woah, James, how many books have you written?